In an increasingly dynamic and volatile world, the issue of defence and security is at the top of national agendas across the globe. For Europe therefore, taking the responsibility for defence is more vital than ever. We need to ensure a vibrant defence technology and industrial base, and strong defence capability in Europe, whatever future threats may arise. The Air Combat Capability Program (ACCaP) will be one of the most significant military investments for Belgium for many years, not just in terms of the need to replace Belgium’s fleet of F-16s, but, vitally, in addressing the country’s long-term security interests. We believe that our European offer to Belgium, through Eurofighter Typhoon, is the best solution to meet the country’s immediate and long-term defence, security and industrial needs. First, the UK, Germany, Italy, and Spain, remain fully committed to the Eurofighter programme as the backbone of European combat air power into the middle of this century – both for the current user family and for those who may join us in the future. We see Eurofighter as the vehicle through to a future European replacement solution in collaboration with our European trusted partners. Second, we can also say with absolute certainty that Eurofighter is a true collaborative European programme, designed, manufactured and assembled across Europe. Our aircraft is a low-risk, combat-proven, multi-role fighter capable of meeting all of Belgium’s operational requirements. Almost every Euro spent on Eurofighter remains in Europe across a broad European supply chain involving more than 400 companies and 100,000 jobs. Even after the UK leaves the European Union, 70% of every Eurofighter aircraft will still be designed and manufactured within the EU. Eurofighter is the very definition of a European product with the consortium of Airbus, Leonardo and BAE Systems supporting a significant existing footprint in Belgium worth an estimated 600m Euros per year. Third, the Eurofighter partner nations and our expanding family of customers are strongly committed to future investment and development of the aircraft ensuring the continued evolution of capability to meet the common threats to European security into the 2050s. Belgium will be able to participate industrially, and influence the future direction of that evolution. 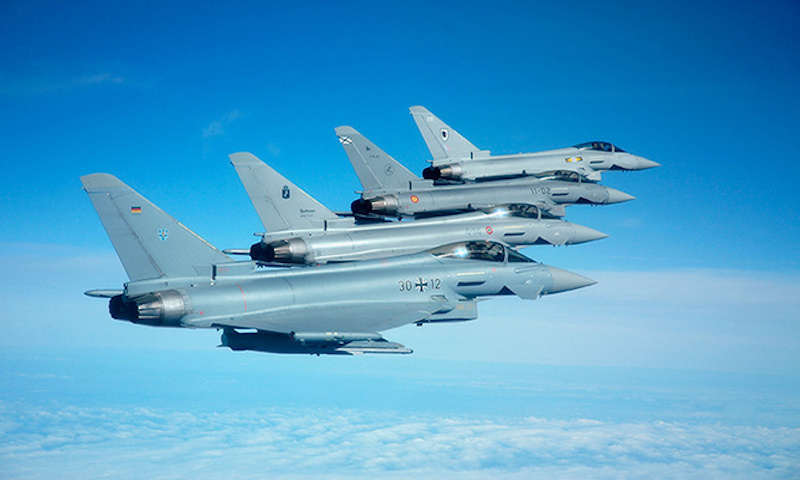 Eurofighter is the continent’s largest collaborative defence programme. In Airbus, BAE Systems and Leonardo, Belgian industry would be working alongside three of the world’s biggest defence companies – with a proven pedigree of credibility, capability and collaboration. For industry in Belgium, becoming the next European partner in Eurofighter would ensure Belgian investments in defence capability provide access to future programme workshare, benefitting both Belgium and Europe, sustaining high value, high technology industrial capability and jobs across the continent. Much has been said already about the various industrial proposals of those seeking to partner with Belgium. For our part, we know Belgium has world-leading capabilities in aerospace and defence, and our Eurofighter offer seeks to build on that. Our industrial partners will invest in advanced technology research and development in Belgium. They will invest in building defence capability through transfer of world leading synthetic training and advanced management concepts for aircraft maintenance and logistics, and will invest in the development of a National Cyber Capability for Belgium. These are the key pillars of the Eurofighter offer. Independently assessed by a recognised economics analytics company, the Eurofighter offer is conservatively estimated to generate 19 Billion Euro of direct contribution to the Belgian economy. It will sustain an estimated six thousand jobs, in the aerospace and defence sector, whilst the protection of vital sectors of the national economy and investment in future cyber research and development will significantly reduce the estimated 1 per cent of Belgian GDP thought to be lost to cyber related activities each year. The Eurofighter consortium companies have a proven track record in the ability to share IPR, skills, knowledge and transfer of technology worldwide. It has delivered industrial benefit in other areas of the globe exactly as promised. It is there for all to see. The world around us continues to change. We argue that the need to strengthen defence and security capability in Europe has never been greater. Eurofighter is at the heart of that, and we look forward to welcoming Belgium as its next member.